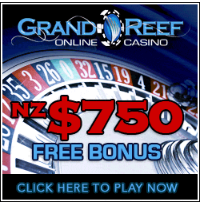 Caribbean Stud Poker is a popular variation of traditional five-card stud poker that you will find at most casinos and gaming clubs across New Zealand. The rules and format are essentially the same; the only difference is that players do not compete against other players; rather, they compete against the dealer. This eliminates the whole aspect of bluffing and reading, making Caribbean Stud Poker a simplified version of five-card stud that all players can enjoy. Players must place their ante wagers before the dealer calls ‘no more bets’. After this happens, each player and the dealer are dealt five cards. The dealer reveals only one of his own cards while each player is allow to look at all five that have been dealt to them; however, they may not discuss their hand with any other player at the table. After checking their cards, players can choose to fold (losing their ante wager) or play (doubling their ante wager). After this round of betting, the dealer reveals all five of his own cards. At this point, each hand is compared to the dealer’s to determine which players win. All players win if the dealer’s hand does not qualify (with Ace-King high). Since Caribbean Stud relies on a very simply gaming format, the general strategy for the game is also quite simple. Players are not able to manipulate the outcome in anyway; so, there are only a few key decisions that can be made in order to ensure a successful and profitable outcome while playing Caribbean Stud. Essentially, what you want to do is reduce the house’s edge. You can do this simply by deciding which hands you should and should not play. As such, you should fold all hands lower than Ace-King , as this hand and all lesser hands do not pay out. If you decide to play Ace-King, then you are simply relying on the fact that the dealer’s hand will not qualify, and the prize for this outcome is just even-money and not worth the risk. You should play all pairs or higher ranking hands. Even if you have a low pair, there is always the chance that the dealer’s hand will not be greater than Ace-King, so you can actively lower the house edge to about 2% to 3%. Caribbean Stud Poker is a variation of another, more complex casino game. As such, there are no variations of this particular title in the online gambling world. If you are looking for something a little bit different but operating on the same premise, try video poker, Casino Hold ‘Em or Let it Ride. These are all games with simply poker formats, which do not rely on bluffing or reading to make a profitable outcome. Caribbean Stud Poker offers players the ability to wager on the possibility of winning a progressive jackpot prize. If you place a $1 side bet during the initial betting stage, you can opt in to the progressive jackpot pool. If you hit a Royal Flush, then the progressive jackpot is yours. Some games also offer players the chance to win 10% of the progressive jackpot pool if they hit a straight flush. Caribbean Stud Poker is a popular staple in the online gambling world. So, every online casino provider offers this case. While you may not find it at all online casinos, you can be sure that Microgaming, PlayTech, IGT, Net Entertainment and Boss Media all have this game in their roster. When it comes to the progressive jackpot version of the game, IGT and Net Entertainment offer generous progressive prizes.